At Eastern Shore Dental Care we are proud to offer the latest technology for teeth whitening from GLO Science. Their patented Guided Light Optics (GLO) system combines warming heat with light and professional strength whitening gel to create fast, long lasting results. All of the technology is held inside a closed-system mouthpiece to prevent the gel and oxygen from escaping the mouth during the treatment for the most efficient results. There’s no sensitivity, and most treatments take less than an hour as you sit back and relax in a comfortable chair. GLO is safe to use on crowns, caps, teeth with dental bonding, and even veneers, so there is no worry about discoloration or staining of dental restorations. On average, patients see an improvement of up to 5 tooth shades whiter after an in-office GLO treatment. The mouthpiece used in the office for the whitening session is then yours to take home and use with the GLO Pro Take Home Kit – an easy way to maintain your whitened teeth at home using the same professional whitening gel as in our office. 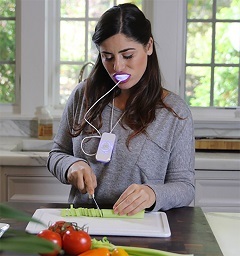 It comes with a lightweight control unit on a lanyard so that you can whiten your teeth hands-free. To learn how it works, watch this brief video as Dr. Jonathan Levine, renowned cosmetic dentist and inventor of the GLO Science system describes the process. Are you ready to see yourself with a brilliant white smile? Call us today to schedule a GLO Science Professional Smile Whitening.